Rob holds a LARGE Chinook salmon that son Luke hooked, fought and landed on their annual father-son fall fishing trip on the Manistee river. 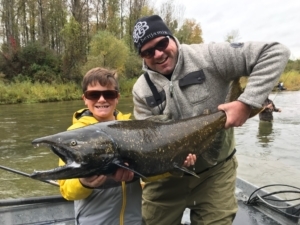 The Muskegon river fishing report for October 8, 2018 in the Newaygo, Michigan area is about the onset of our annual Chinook salmon spawning run and the fall Steelhead run that will follow. With recent rains that went through much of Michigan and most of the Muskegon river watershed, river levels are up and water temperatures are slowly dropping. Click HERE for current Muskegon river water flow data. A majority of the salmon in the river right now are “staging” in deeper pools and runs, before seeking out spawning grounds in the days ahead. Click HERE to read a short article on Muskegon river Chinook salmon fishing. With both fly fishing and conventional equipment, we’ll be in pursuit of salmon for another couple weeks before shifting attention to fall Steelhead. The short term forecast is calling for additional rains to come through west Michigan in the days ahead and this will only help bring more salmon and steelhead into the system. Click HERE for a updated weather forecast for the region. There are some BIG salmon coming into the rivers of west Michigan this year and we’ll likely see some brutes in the Muskegon river soon. The same should hold true for our fall and early winter steelhead fishing, which kicks off soon and will go through December and even early January. The Muskegon river has arguably the longest fall and early winter steelhead season of any river in the Midwest. Present water flows are in the 2400 cfs range, normal flows for this time of early October is around 1400 cfs and present water temperature just above 60 degrees.